A true gem on Victoria’s stunning Great Ocean Road. 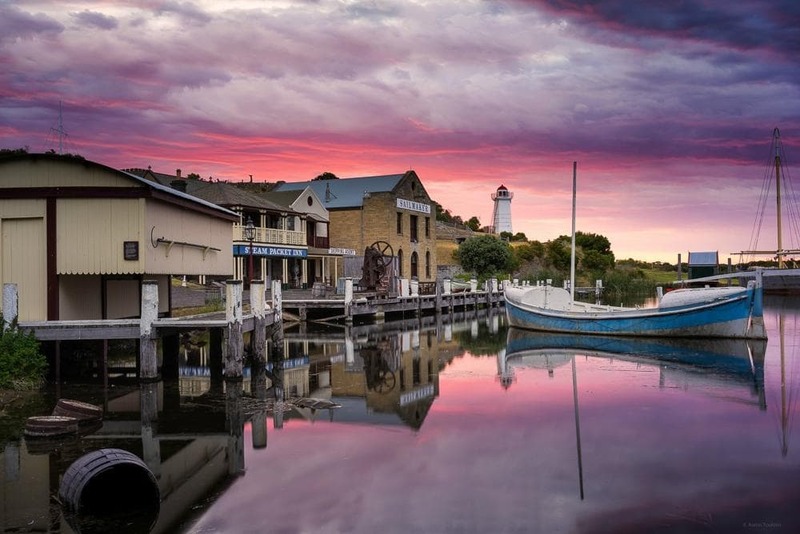 Warrnambool is Victoria's largest coastal City outside Port Phillip Bay, and a major destination for people travelling along tourist routes including the Great Ocean Road, Princes Highway and the Melbourne-Warrnambool railway. Warrnambool is a city situated on Victoria's far south-west coast between Port Fairy and Port Campbell. The City is a popular tourist destination separated from the ocean by coastal reserves and parkland. The coast around Warrnambool and down to Cape Otway is known as the Shipwreck Coast, due to the large number of water vessels that ran aground in the 1800s and early 1900s. The main swimming beach is Bathing Beach, situated at the top of Lady Bay. Behind the beach is the 20 hectare Lake Pertobe Adventure Park with its playgrounds, fitness equipment, BBQs, a kiosk, and a large lake with footbridges, islands and paddle boats. At Logans Beach is a whale viewing platform, making it one of the region's best observation points for whale watching between June and September. As well as the extensive coastal reserves lined with walkways, Warrnambool boasts a number of attractive parks and gardens including the colourful Fletcher Jones Gardens, set within the grounds of the clothing factory and floodlit at night. Flagstaff Hill is a state heritage listed site overlooking the beautiful Lady Bay. Both a living historical village that displays the life of a 19th century port and town, and holder of Victoria's largest maritime shipwreck collection, it occupies a beautiful site, tumbling down the bluff towards Lady Bay. You can explore the village area that has over 40 buildings and vessels spread over 10 hectares. Flagstaff Hill is a place to remember and experience the stories of these early battlers who laid the foundations for life as we know it today. Logans Beach is most famous as the breading ground for the Southern Right Whale. Each year roughly between late May and early October, the whales return to their nursery at Logan's Beach where they can be viewed from a specially constructed platform in the sand dunes or from the beach. The platform is free to access and is open at all times. In clear view of the shore, the females nurse their cubs while the males and yearlings remain further out to sea. Childers Cove and the nearby Murnanes Bay and Sandy Cove could be the Great Ocean Road’s best hidden gems. The twin inlets feature towering limestone cliffs on three sides and the mighty southern ocean ahead of you. Sandy Cove as the name suggests, has more sand and lends itself to either an idyllic beach walk or to just find a spot to sit and marvel at the sandstone stacks protruding from the sea. What truly makes Childers Cove special is that while the 12 Apostles attract millions of visitors each year, this is a place which is just as spectacular that in all likelihood, you will have to yourself. The Warrnambool to Port Fairy Rail Trail is a continuous 37.32km walking/cycling pathway which meanders through a highly scenic, diverse and relaxed part of south-west Victoria. Encompassing historical, agricultural, Indigenous and nature-based themes, it is a 'must do’ for anyone visiting the region. The breakwater is a great place to take the kids fishing, offering a sheltered place to relax. Fishing can be done on the bay side with smaller rods or over the breakwater facing the ocean with surf rods chasing the bigger fish. Boat launching is also available at the breakwater. These elegant, sheltered gardens feature wide curving paths, old and rare plants, a band rotunda and a lily pond which is home to ducks and turtles. Warrnambool’s Botanic Gardens were designed by celebrated landscape gardener William Guilfoyle in 1879, shortly after he completed the Melbourne Royal Botanic Gardens. For budding botanists, the gardens have an extensive collection of plants, including remnants of original planting, and more than 40 different coniferous species. The Lone Pine in the centre of the gardens was planted in 1934. This tree was grown from a seed harvested at the original Lone Pine at Gallipoli, one of only two “child” trees still standing. Spanning 8.1ha, the gardens’ large open lawn areas and picturesque vistas are the perfect backdrop for weddings, community events and family picnics. In early 2019, Warrnambool will become the proud home of one of the country's most indulgent wellness attractions. Deep Blue Hot Springs will reveal a redevelopment where bathers will be able to meander amongst the rock pools and cave formations as they take to the alluring natural healing waters which will be available in over 20 different, purpose built, open air geothermal pools. Among the geothermal bathing pools will be a host of other quality wellness experiences including Reflexology, Steam, Mud & Colour Therapy caves, Private Bathing pools, Relaxation Massage and Salt Therapy rooms.